Dublin is home to world-class restaurants, many with Irish-inspired menu items to satisfy your Irish appetite. Not only is Irish an attitude in our city, it’s an entrée as well! Here’s a list of the top 9 places you have to eat while visiting Dublin. 1. 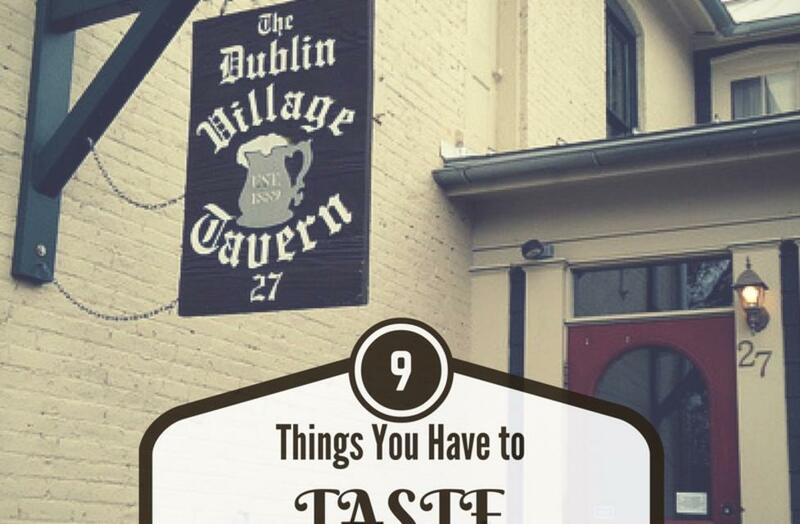 Dublin Village Tavern- This is a local favorite due to its historic building and Irish atmosphere. 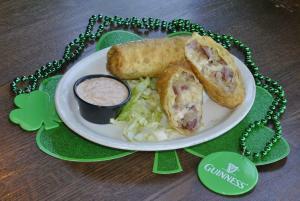 Try the Irish Egg Rolls as a starter before indulging an Irish kettle dinner. Full Menu. 2. Dublin Village Tavern- You can’t leave the DVT without an Irish Car Bomb Brownie to top off your meal… The locals rave over this sweet treat! 3. Brazenhead Pub- Modeled after the oldest pub in Dublin, Ireland, this Irish pub offers a multitude of Irish meals, beers and entertainers. A local favorite is the Guinness beer-battered fish and chips and you can’t forget about a cold Guinness on the side. Full Menu. 4. Brazenhead Pub- If Guinness isn’t your forte, try the Irish Rueben for a twist on a classic sandwich. While dining, check out the décor imported directly from Ireland. 5. Whole Foods- The Dublin Whole Foods Market has a variety of Irish cheeses, soda bread and beers on sale for you to take home and arrange for family or guests. It provides the perfect touch to show off your Irish Attitude. 6. Graeter’s Ice Cream- I scream, you scream, we all scream for ice cream! 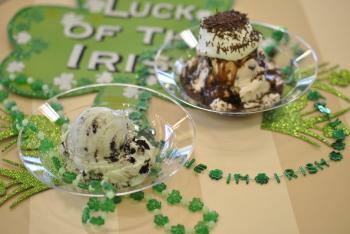 The Dublin, Ohio Graeter’s is the only store you can find a Shamrock Sundae. Full Menu. 7. Sisters Sweet Shoppe- If you have a sweet tooth, this shop is the one for you! These sister’s offer everything from Dublin milkshakes and mint chocolate chip ice cream sandwiches to shamrock snack packs and green mint fudge brownies. Indulge your sweet tooth at Sister’s Sweet Shoppe. 8. Tehku Tea- This Indonesian tea shop offers “Kiss Me I’m Not Irish” and “My Irish Blend” teas along with green scones. This local tea shop makes all of their teas in house giving them all a special twist in an Irish-loving city. 9. Pint Room- The name fits the atmosphere for this Dublin restaurants… With a large selection of beers to fill your pint and their Irish Sandwich is the perfect combination for lunch. Full Menu. With all of these delicious choices, how are you ever going to choose?! We suggest you try them all! Don’t forget to tag your photos with #SoDublin to be featured on our website. Click here for a full list of restaurants in Dublin.